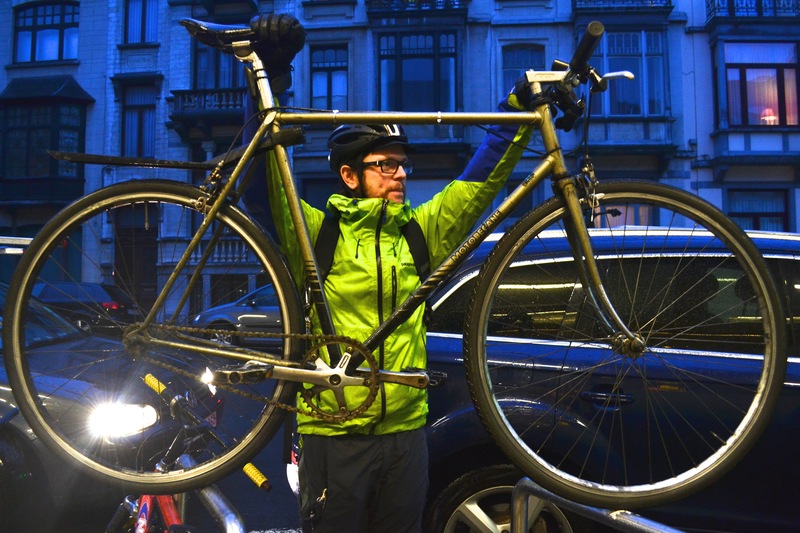 Photographer’s notes: Brussels had a fast and hard hailstorm yesterday driving most riders to seek shelter in doorways and overhangs. Back on the road, riders were few and far between. Everyone was wet, everyone was trying to get the daily ride done. But if someone is on the road, it is the bike messenger. Not a great photo. Taken about 17:30 as we came across each other at a local supermarket getting evening supplies. Even at this time of year, the skies are usually brighter, but the storm clouds had swept the horizon and everything was just so dark. I was just glad to find someone who could document the day and the weather. This entry was posted in bike messenger, Europe, vintage, weather and tagged 2015, fixie, hailstorm, January, Motobecane, single gear. Bookmark the permalink.